Not specified in Bible verses, I have made it mid day. The Shunammite woman’s husband (in green) carrying his ill son, a servant, donkey, reapers in field. 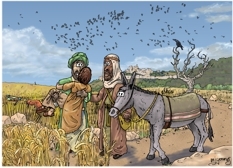 The boy being carried is the son of the Shunammite woman & her husband, his birth had been miraculously predicted by Elisha (see verses 15-17). The Lord provided the previously barren Shunammite woman with the son she desired. But then this awful turn of events takes place: the boy grows ill whilst out in the fields, & verse 20 tells us that he dies in his mother’s arms. 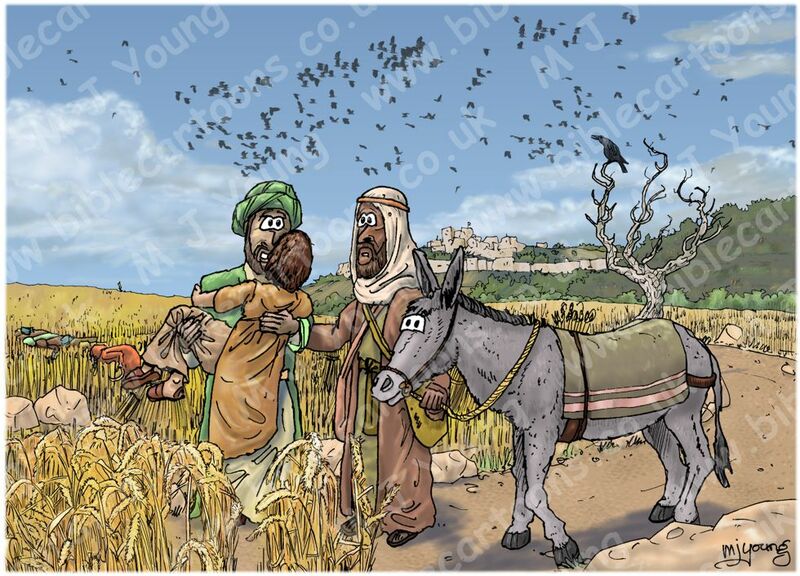 This scene shows the boy becoming ill & being carried by his father to a servant on the margin of one of the fields. The servant has a donkey by him, to carry the ill boy to the village of Shunam, which you can see on the top of a hill in the background. Notice the line of reapers in the middle distance, to the left of the foreground figures. These are a line of women, bending over, using hand held sickles to cut the wheat. In strong sunlight & bent over all day, these must have been hardy people indeed! The wheat was then stooked (bundled & stacked upright – see scene below) to be collected later & threshed, which separated the grain from the chaff. The wheat in foreground started out as a photograph I took in a local farmers field. I have heavily modified it, flattening the colours, changing colour & tonal contrast, adding a black outline, etc. I am very pleased with the resulting image. I decided to add a flock of Crows flying over head, with a large one cawing in the dead-looking tree! Apparently a collective noun for a flock of Crows is a horde, hover, muster, parcel or a murder of Crows – a most unfortunate name! I researched the position of the village/town of Shunam & it was built on a hill, hence my scene. I imagine there were many fields all around the village, with olive groves, vineyards, etc as well. All of which I have added to the background of my scene. Shunam was situated in the southern part of the Jezreel valley (also called Esdraelon) which is a very fertile, agricultural valley in northern Israel. See map below. 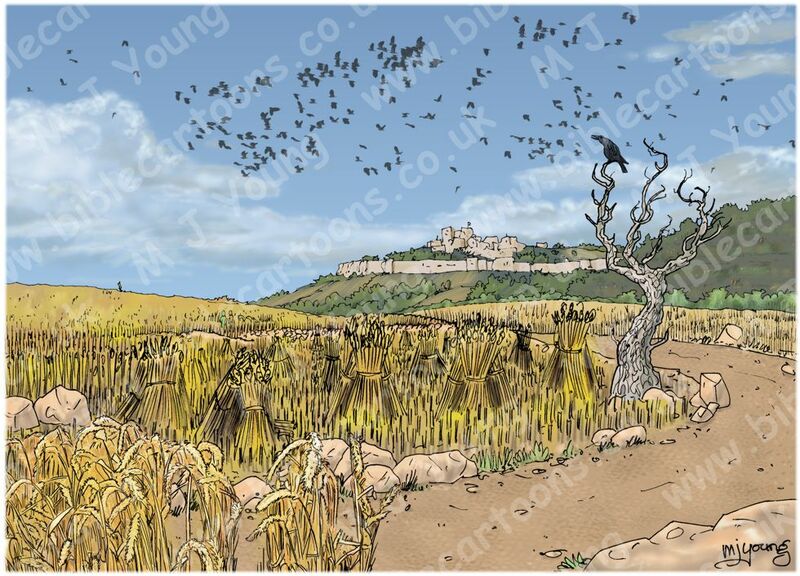 Scene without the figures, to show the wheat fields, reapers (harvesting the wheat by hand) & the walled village/town of Shunam in the background. 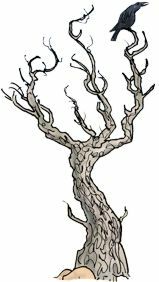 I have always liked drawing crows in old, dead trees!